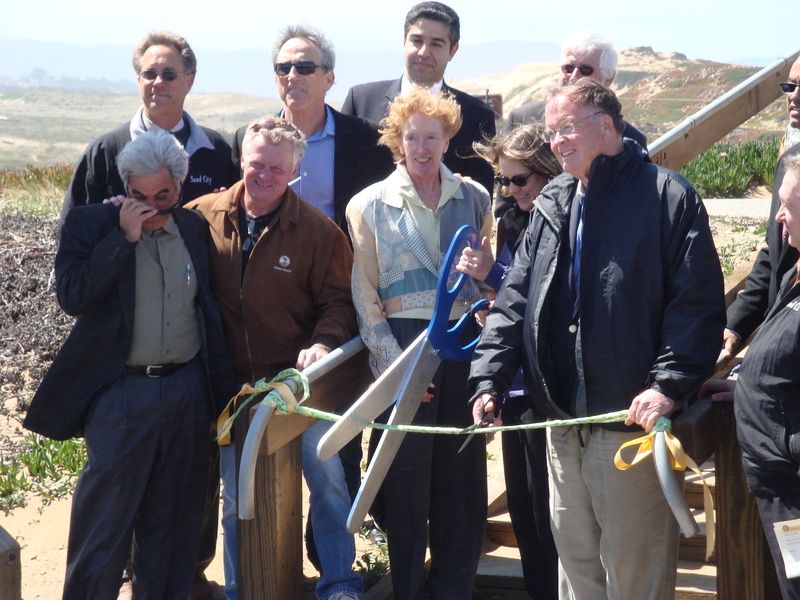 The Ribbon Cutting – Marina Mayor Bruce Delgado tries to wipe the sand out of his eyes while Supervisors Dave Potter and Jane Parker grin and bear it. As a squadron of other dignitaries attempt to form a wind break, California State Parks Director Ruth Coleman and Representative Sam Farr attack the ribbon with scissors big and small. A crowd consisting mainly of public officials and State Park employees endured hypothermia, sand blasting and seven congratulatory speeches this morning at the Fort Ord Dunes State Park Grand Opening. Though much of what was said was blown away by the wind before it could reach the sand-filled ears of the audience, it seemed appropriate that the forces of nature should prevail over amplification. The ceremony, after all, took place just inland of the spot where Stilwell Hall once stood. When Stilwell Hall was built, in 1943, it was about 400 feet from the edge of the coastal bluff. When it was demolished, in 2003, after decades of work to slow or stop the shoreline from eroding in front of it, it was less than a foot from the edge of the bluff and poised to fall into the ocean at any time. Its memory lives on today as a kind of object lesson in the futility of opposing natural forces. When the closure of Ft. Ord was first announced it looked like the lessons of Stilwell Hall might not have been learned. Delusional plans for building theme parks, luxury resorts, condos, cruise ship facilities and more on the rapidly eroding dunes were all the rage among local officials. But common sense has prevailed and if today’s ceremony stood for anything, it stood as a celebration of this fundamental change in attitude. This entry was posted on Wednesday, April 15th, 2009 at 3:22 pm and is filed under Coastal Development/Erosion. You can follow any responses to this entry through the RSS 2.0 feed. You can leave a response, or trackback from your own site.